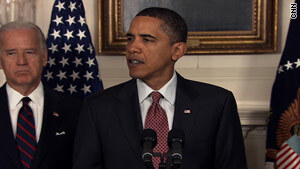 President Obama is expected to ask for an increase in federal education spending during Wednesday's State of the Union. Washington (CNN) -- Despite a heavy focus on fiscal discipline in his first State of the Union address, President Obama will announce an increase of up to $4 billion in federal education spending, according to senior administration officials familiar with the speech. A big chunk of that boost will be an increase of $1.35 billion for Obama's signature "Race to the Top" grant program, aimed at sparking innovation in schools across the country, the officials said. An additional $1 billion will be targeted at overhauling the No Child Left Behind Act, former President George W. Bush's signature program, which has come under criticism from lawmakers on both sides of the political aisle. The budget plan will "improve outcomes for students at every point along the educational pipeline," and will include attempts to squeeze out some savings, one of the senior administration officials said. "While the budget will reflect tough choices and the consolidation of many existing K-12 education programs, a 6.2 percent increase for the Department of Education will show a significant effort to help fund the administration's new reform efforts," the senior official said. The aggressive increase for education could help deflect criticism from liberals over Obama's broader call for a three-year freeze in non-security discretionary spending, which would include popular domestic programs. Though the goal is freezing non-security discretionary spending at $447 billion this year, some federal agencies might see budget increases, balanced by cuts at other agencies. Non-security discretionary spending refers to an array of domestic programs -- everything from agriculture to energy. The freeze would not apply to Social Security, Medicare, Medicaid or other entitlement programs. The $447 billion is part of the roughly $3.5 trillion federal budget.